It matches my room color perfectly and it’s sooo soft and light! Great for a summer comforter. Sweet, serene simplicity are the key players in this lovely and lofty comforter set. Touchable microfiber is soft and resilient, holding up to years of use. Alluring quilted and pleated designs lend texture and interest to the set. The length of the comforter is too short for my queen bed and the sides are about 4 inches too short. You can see my sheets and blanket on the sides sticking out I do not recommend this comforter for this reason. I hope to return this item. Love the color (more of a pastel) and the quality is good. I love this set! The color is sea foam, and goes great in my blue room. The comforter is thick an fluffy, and there were European shams included. It's such a joy to hop into bed with this snuggly set. I love this comforter set. It’s so comfortable that it makes me feel like I’m at a spa or somewhere on vacation every night. Beautiful comforter set. Purchased because it had everything I needed, including comforter, bedskirt, shams and accent pillows. The set is very soft and comfortable. I have a queen bed but bought a king set so I could tuck the sides and this works very well. Great purchase! I spent days deciding on this set and I love the color and style. The outer material is a bit thinner than I expected, but is soft, and the comforter Is thick but lightweight. My biggest complaint is that both pillow shams have a line of ink down the middle of them!! I’ve included photos. They look like someone’s sewing marks, but there is no stitching here! Where was quality assurance? These are thoroughly unusable and I’m very disappointed! We moving into a new house and I bought this for our new master bedroom - i wanted a light and airy feel to the room. This aqua color is beautiful, easy on the eyes and inviting. the comforter itself is very soft. It remains to be seen how it will hold up, but at first glance it appears to be well made. I'll certainly put it to the test in my house with two little ones jumping on everything! Would recommend this. The color is true to the picture. It is the most comfortable comforter we have ever purchased. The euro pillows look elegant and finish the set very well. 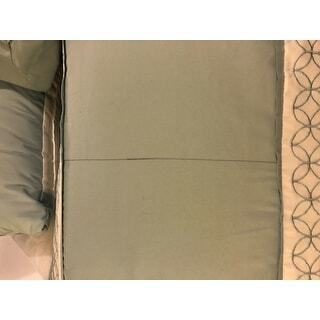 Bought this for our master bedroom and it’s a really pretty aqua color. We live in a moderate climate so warmth wasn’t a priority when purchasing this. If you live somewhere that you need more warmth at night, either add more blankets or try something thicker than this comforter. Love color and style. Just what I needed for my guest room.. This photo doesn’t depict the true color. In real life. It’s much much brighter. Beautiful color, simple design, high quality. Ordered king size, but it barely covers a full size. I fully recommend this comforter. Fits the bed beautifully, color is gorgeous and the material used is very elegant and soft. I really like the color and how soft this bed setting is. Just how it looks in the pictures. Lovely and elegant. Great value. "Is the accent color white? Previously I purchased a set that appeared white but was in fact off white/cream." The tone is off white. "I have a pillowtop mattress. Will this comfort accomodate it or will it be too short on the sides?" This comforter is 104'' X 92". I hope it helps. "Do you sell this rug. If so, what is the product number"
Unfortunately no, this rug is not available. "This is a beautiful comfortable, but looks kind of stiff. How does this hang around the edges of the bed?" In my opinion, this comforter is not stiff. 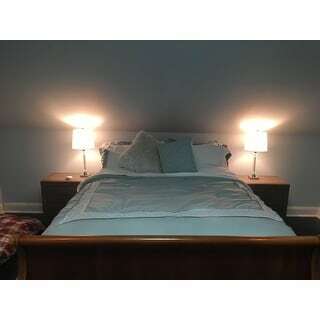 "Is this set offered with a coverlet instead of a comforter? I live in a warm climate and a comforter will probably be too heavy. Thanks"
Unfortunately. it does not come in a coverlet option. 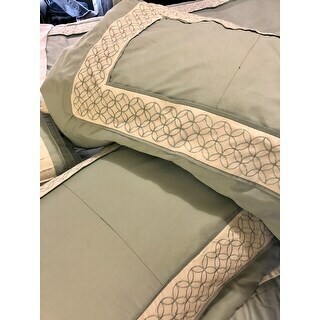 Hi Laura - Yes, it is washable - I put one of these comforter sets in a villa rental and the guests who left us yesterday left an awful mess and our management company had to launder several comforters, including this one. I have just received a report from them that it has washed successfully. Hope this helps! "Does the comforter wrinkle? I fold it down to end of bed at night." It wrinkles a little bit. I never ironed mine when I pulled it out of the packaging so it's always had some small wrinkles. I don't think they distract from the bedspread though. Because it is tufted, the wrinkles blend into the tufting.